In fundraising, there are plenty of strategies nonprofits use to increase revenue. There are peer-to-peer campaigns, special events, and of course that holiday season push. But what about the rest of the year? Here at Donorbox, we want to help you with fundraising year-round. Matching gifts are not seasonal. They are not only available for a limited time. Of all the nonprofit funding sources out there, organizations should definitely be using matching gifts to boost revenue every day of the year! But what are matching gifts, you ask? Matching gift programs are set up by companies and corporations as an employee benefit. After an employee donates to a nonprofit, they can submit a matching gift request to their employer and the company will make an additional donation to that nonprofit. Match ratio: The match ratio refers to the amount of money a company will pay in relation to the original donation made by the employee. A 1:1 ratio means that a company will donate the exact same amount. The match ratio can be anywhere from .5:1 to 3:1, though it is most commonly 1:1 or 2:1. Minimums and maximums: Matching gift programs will almost always specify a minimum and maximum amount for qualifying donations. If an employee donates less than the minimum, they are not eligible for a match. If they donate more, they are only eligible for as much as the specified maximum amount. Employee status: Sometimes the match ratio, or even an employee’s eligibility, depends on the employee’s status. For example, a part-time employee might be eligible for a 1:1 match, while a CEO of the same company qualifies for a 2:1 match. Often retired employees are eligible for matching gifts as well, though sometimes at a reduced ratio. Type of organization: Some companies will narrow their matching gift programs to organizations of a certain kind. For example, some companies will not donate to organizations with religious goals, though they are technically classified as a 501(c)(3). Deadlines: It is important to check your guidelines specifically for the deadline for requesting matching gifts. Some companies put their deadline at the end of the year, while some use Tax Day as their cutoff. These are the key pieces to every matching gift program. As you become more familiar with matching gifts, you will see these terms and phrases over and over again. Now you’re an expert! 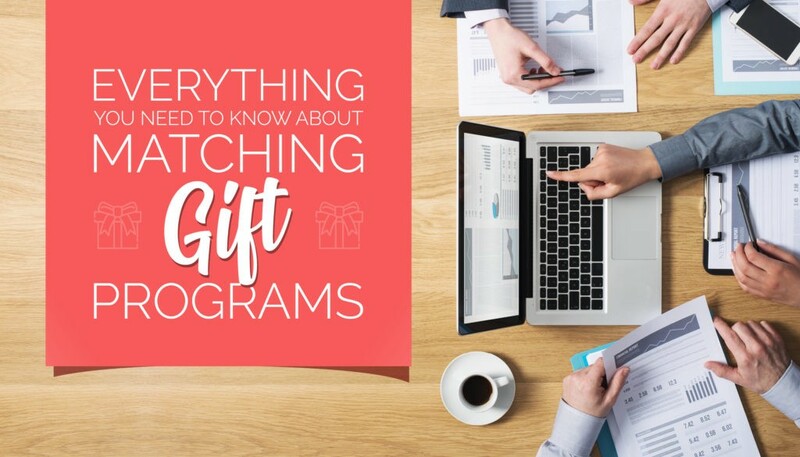 As you navigate the world of matching gifts, there are certain programs to keep an eye out for. These companies (along with many others) are very committed to matching gifts. Let’s talk about a few of these programs and what makes them special. General Electric: GE Foundation created the concept of corporate matching gift programs in 1954. They offer matching gifts to current employees of all levels as well as retirees. Participants are eligible to match up to $5,000 (maximum) each year. BP: BP is unique in that they will match, in addition to personal donations, all money raised by an employee. So if a BP employee raises $5,000 in a peer-to-peer fundraiser, they can have that entire $5,000 matched. Microsoft: What’s nice about Microsoft is that their minimum is $1 and their maximum is $15,000! They also offer $25/hour in volunteer grants, so time spent volunteering is eligible to be matched monetarily. Apple: Apple Inc. has a match ratio of 2:1 for all employees! Plus, they offer volunteer grants of $50/hour, which is much higher than usual. These are just a few of the exceptional matching gift programs out there. As you expand your matching gift fundraising, keep an eye out for these programs and make sure to follow-up with those employees. There is $4-7 billion in matching gift revenue left on the table each year, and all you have to do is ask for it. An employee makes the initial donation: The first step is always that initial donation. There can be no matching gift without an initial gift to match! Employee submits matching gift request: This is the most crucial step in the process. A donor must take the few minutes to request the matching gift from their employer. A nonprofit organization or educational institution can not make that request, even when they know that a donor is eligible. Employer checks donation eligibility: Often companies will have someone on staff who is dedicated to matching gifts. This person (or team) will make sure that a donation is within the specified minimum and maximum amounts, check the employee’s employment status, and make sure that the organization itself is covered by the program guidelines. Employer verifies donation: Once the donation is verified as match-eligible, the company will contact the nonprofit organization or educational institution to confirm the donation amount, date, and donor. The organization collects the matching gift: The last stage, of course, is when the organization receives that matching gift from a company. The process is really quite simple and quick. The most vital step of the process is number two; an organization must do everything it can to encourage a donor to submit that matching gift request to their employer. Now comes the most valuable part of the article: we will tell you exactly what you can do to increase your matching gift revenue. The biggest hurdle to collecting matching gift revenue is lack of donor awareness. Not only do donors not know if they are eligible for matching gift programs, but they also don’t even know what matching gifts are. A donor is more likely to submit a matching gift request if you can ease the process for them. Double the Donation has created a search tool that allows donors to search through an extensive matching gift database of more than 20,000 companies and subsidiaries to find if their employer offers matching gifts. Marketing matching gifts is the single most crucial action an organization can take toward increasing matching gift revenue. And with matching gift revenue basically being free money, it’s hard to come up with reasons not to take advantage of this. Donation page: The most effective place for a matching gift search tool is embedded right onto your donation page. While a donor is actively contributing to your organization, that is the most effective time to ask them about their employer and inform them about their own match-eligibility. Dedicated matching gifts page: As stated earlier, it is your responsibility to inform donors about matching gifts, and a dedicated matching gifts page is a great way to do it. Use this page to explain what matching gifts are and how the process works. Also, provide an embedded search tool or a link to one so that your donors can check their eligibility. Plus, you can link back to this page in any communications moving forward. Navigation bar: Include your dedicated matching gift page on your website’s main navigation bar. This encourages casual visitors to your site to learn more about what matching gifts are and, hopefully, check their match-eligibility. Emails: Any email you send out should include information about matching gifts. You should always include a link to your matching gifts page in your email communications. Let your donors know that they might be eligible to double their donations. Social media: Social media is a great way to widen your audience. And with a wider audience comes more potential for matching gifts. Share the link to your matching gifts page or your search tool. Additionally, shine a spotlight on donors who have their gifts matched. This encourages the same donor to donate and have their gift matched again, as well as inspiring new donors to check their own match-eligibility. The strategies about matching gifts listed above are not mutually exclusive. In fact, you should incorporate as many strategies as you can. You never know which one is going to finally encourage that donor to submit a matching gift request. Conclusion: Matching gifts offer too great an opportunity to ignore. You are now an expert on matching gift guidelines, major matching gift programs, the process of getting donations matched, and how to truly boost matching gift revenue by marketing matching gifts.